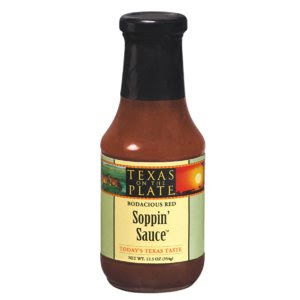 This month's HEB Primo Pick featured item is Texas On the Plate Bodacious Red Soppin' Sauce. Originally created as a big-flavor way to easily baste...or sop...meats as they grill, this is one versatile sauce. It can also be used as a marinade for meat or as a flavorful cooking sauce. It's a little sweet, a little spicy, and a little tangy thanks to a combination of ingredients and spices. No matter how you use it, this sauce is just plain delicious! Texas On the Plate started with a cookbook by Fredericksburg-based chef Terry Thompson-Anderson. After her readers told her she should bottle the recipes in the book...she did exactly that! Texas On the Plate includes a line of four big-flavor condiments based on recipes from the cookbook. I don't really BBQ that much, so I played around with an easy pulled pork recipe made using a slow cooker. 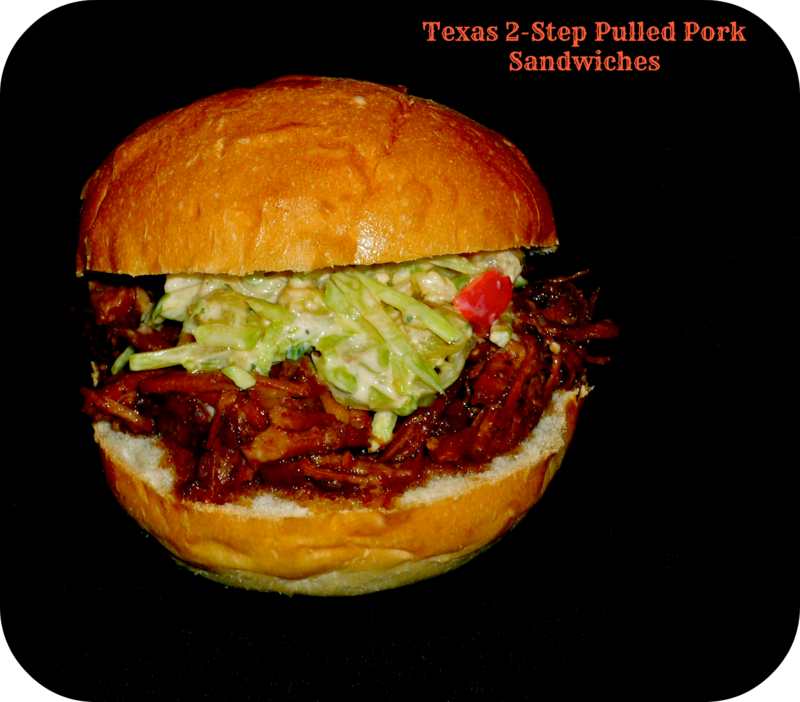 What I came up with was my super-flavorful Texas 2-Step Pulled Pork Sandwiches. I bought some flavorful pork shoulder, added Soppin' Sauce and a bit of wine, and then added a few other ingredients I had on hand in the kitchen. Then? I let everything cook on low in the slow cooker all day long, until the meat was literally falling-apart tender. The meat can be started before you leave for work in the morning, because the prep takes all of 10 minutes. In return, you'll come home to a mouth-watering aroma coming from your kitchen. Step 1: Add 2 lbs. pork shoulder to a slow cooker. I cut mine into three pieces to make it fit easier into my cooker. Top with 1 cup Texas On the Plate Bodacious Red Soppin' Sauce and 3/4 cup white wine. Add 3 roughly chopped garlic cloves, one sliced large shallot, and 2-3 sprigs fresh thyme. Give everything a stir, cover, and cook on Low for about 8 hours. Step 2: Remove the cooked pork from the cooker -- it'll be tender, so be sure to use tongs! Let it cool for a bit, then shred with fingers or a couple of forks. Add the shredded pork back to the juices, give it a stir, and let the pork soak in the rich sauce for at least 15 minutes before serving. To serve, use a slotted spoon to place some of the pulled pork onto a bun...otherwise, you'll get a soggy sandwich. That's messy and just no fun. Add your favorite toppings...Michael opted for cheese, and I used some broccoli slaw that I picked up at the take-away counter at HEB. To keep things really simple on a busy weeknight, I let these sandwiches be the star of the show and simply served them with potato chips. This was some amazing pulled pork...full of flavor, and all I had to to was pour in the Soppin' Sauce, add a few other ingredients, and let my slow cooker do all the work! We really enjoyed how the sweet-tangy-spicy sauce complimented the tender pork. I have to say that this pork is even better the next day -- if you mange to have any left! We enjoyed the leftovers -- and all that flavorful sauce -- over white rice the next day. My Texas readers can purchase this Soppin' Sauce...and all sorts of other amazing Primo Picks items...at their local HEB. For those of you who don't have HEB nearby, Texas On the Plate sells their items online. Disclosure: HEB sent me a bottle of Texas On the Plate Bodacious Red Soppin' Sauce to facilitate this feature. All opinions expressed about the product are my own.